The authors of a new report warned that the United States is slipping on degree completion compared with other nations, falling to fourth overall among adults and 10th among young adults. We will ignore the underling causes of this trend "at our peril," they said. But what can colleges and universities do to help? Technology is one part of the solution. Educational attainment isn't advancing fast enough to meet even near-term demand in the workforce, let alone longer-term demand. But, according to a report released Tuesday by the Lumina Foundation, technology can play a role in turning that around. The Lumina Foundation is an organization that advocates for greater participation in post-secondary education in the united States, particularly among underrepresented and high-needs groups, as well as nontraditional learners. It also advocates for quality in higher education. One of its major initiatives is a push for 60 percent post-secondary degree attainment in the United States by 2025. As part of its efforts, the organization has published the first in what's expected to become an annual series focusing on progress toward that goal. 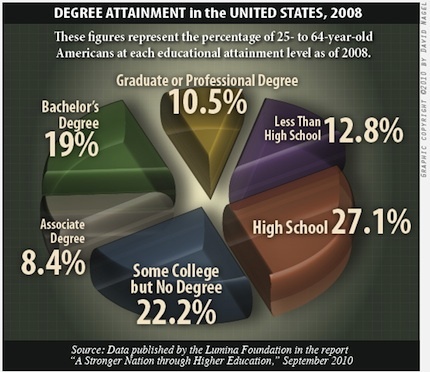 The current report, called "A Stronger Nation through Higher Education," indicated that while there was an increase in the percentage of Americans with college degrees from 2007 to 2008 (the most recent year for which data are available), the increase was not adequate to reach the foundation's graduation goals (the "Big Goal") by 2025. In 2007, 37.7 percent of 25- to 64-year-old Americans had either a two-year or four-year post-secondary degree. That increased 0.2 percentage points in 2008 to 37.9 percent. Though 0.2 points sounds like a small amount, the projected growth in degree attainment it represents is significant: about 112,000 per year, according to the report. Nevertheless, according to Lumina, it's not nearly enough to reach the 60 percent attainment target set for 15 years from now. According to the published report, "The key to reaching the Big Goal is to begin to increase the number of college graduates and to continue that growth each year until 2025. To reach the Big Goal, the U.S. needs to increase the number of college degrees awarded each year, every year, by 278,000. If current rates of degree production continue, the number of graduates can be expected to increase by 112,000 per year. The gap--166,000 college graduates--is how much we need to increase degree production each year to reach the Big Goal." The report's data, based on Census Bureau information, showed that 22.2 percent of Americans have had some college or university experience but have not gone on to finish their degrees. Rounding out the list of non-attainers were those who completed high school but never pursued post-secondary education (27.1 percent) and those who did not complete even high school (12.8 percent). Among those who have attained a degree, 8.4 percent hold an associate degree; 19 percent hold a bachelor's degree; and 10.5 percent have a graduate or professional degree. The United States was previously first in the world in terms of degree attainment; it has dropped to fourth place among adults 25 to 64 and 10th among younger adults (25 to 34). The prevailing force behind that decline, the report's authors asserted, has been an ongoing, drastic economic shift throughout the world. "While concern is certainly warranted, we have come to recognize that the international attainment data in fact indicate an underlying issue," the report said. "The international data reflect a fundamental shift in the global economy which is driving nations to dramatically increase higher education attainment. This shift--the emergence of the knowledge economy--is transforming economies throughout the world, including our own. We ignore it at our peril." One of the hurdles to reaching significantly higher degree attainment, the report's authors wrote, is the vast gap in attainment between ethic groups. Asian Americans in 2008 had the highest percentage of degree completion, at 59.2 percent, followed by Americans identified as white, at 42.2 percent. Only 26.2 percent of Americans identified as black, 22.5 percent of Native Americans, and 18.6 percent of Americans identified as Hispanic held degrees in 2008. "... [S]imply increasing completion rates is not enough," the report said. "It is essential that we redouble our efforts to close gaps in college participation and attainment for a range of underrepresented populations, including students of color, low-income and first-generation students, and adults. Rates of college success for these groups continue to lag significantly, even as they constitute a growing share of the potential pool of students. Since it will be impossible to reach the Big Goal without closing these attainment gaps, doing so must be a high national priority." Technology, according to the Lumina Foundation, has a significant role to play in increasing degree attainment. Among other things, the report recommended colleges and universities revamp their data systems to track student progress more effectively and to aid with retention and success programs. It also recommended expanding and strengthening "lower-cost, innovative options for delivering coursework." Reallocating resources to retention and success programs. The report also stressed the importance of communicating the imperative for higher degree completion, including the fact that, even in the current recession, the pay gap between college graduates and non-graduates is increasing and that, by 2018, according to one study, 60 percent of jobs in the United States will require some form of post-secondary education. A separate report released today by the College Board Advocacy & Policy Center, "Education Pays 2010," backed up the assertion that the salary gap is expanding, describing a "widening gap between college graduates and those without a college degree [that] makes efforts to increase educational attainment even more important." Lumina said it plans to publish annual followup reports focusing on progress in degree attainment. Further information on the current report, including a complete copy of the document and breakdowns by state, can be found here.